The latest job advertisement and employer hiring expectations reveal a buoyant end to 2015 for marketing and communications professionals as Australian businesses respond to the challenges of a post-mining economy and more competitive product and labour markets. A recently released survey by professional recruitment firm Robert Walters reveals that 39% of marketing hiring managers are set to boost the size of their marketing department before the end of 2015, while only 15% are expecting to downsize. According to Robert Walters manager Oliver Smith, most of this increase in marketing hires is focused on mid-level and senior professionals. 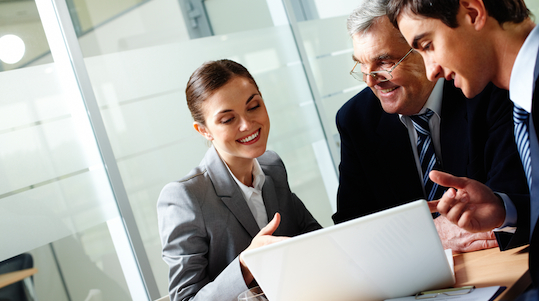 With attention to retention of existing marketing staff in a strong hiring market, hiring managers also reported that pay rises are on the horizon for nearly half of all marketing employees. Very few reported intentions downsize payrolls. “The value of effective marketing is intrinsic to a successful business; where it positions itself, how it communicates with its audiences and the ways in which key brand values are reflected in its product or service offering,” Smith says. Seek’s latest employment data shows that the Australian job market has enjoyed 24 consecutive months of growth, and confirms that marketing and communications is one of the fields experiencing strongest jobs growth. Managing director of employment at Seek Michael Ilczynski says that within the growth in marketing and communications hirings, three roles in particular stand out: internal marketing, brand management and digital related roles. 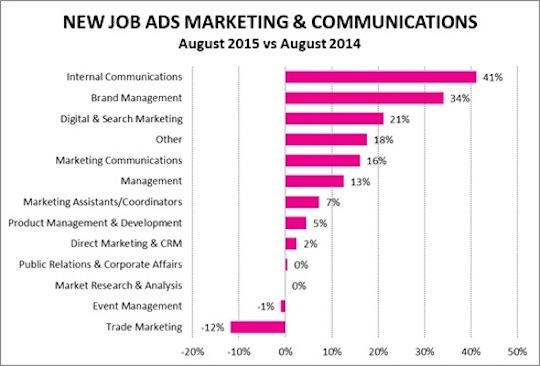 “Industries like marketing and communications are performing strongly with jobs in internal communications leading the pack with a 41% increase this month, while brand managers were also in demand (up 34%),” says Ilczynski. David Khadi, regional director of Michael Page Marketing, explains the spike in certain marketing and communications roles as the result of greater competition resulting in greater strategic emphasis on retention, both for employees and for customers, and because some industries need to catch up with the digital performances of their international counterparts. But Seek’s Michael Ilczynski notes that while the general employment direction for the nation is positive, the growth in hiring is not uniform across the nation. The Seek data shows strongest growth in the Australian Capital Territory (up 30%), followed by New South Wales (21%), Tasmania (17%) and Victoria (12%), while mining-dependent Western Australia is in decline (down 12%) and employment is also softening in the Northern Territory (down 3%). 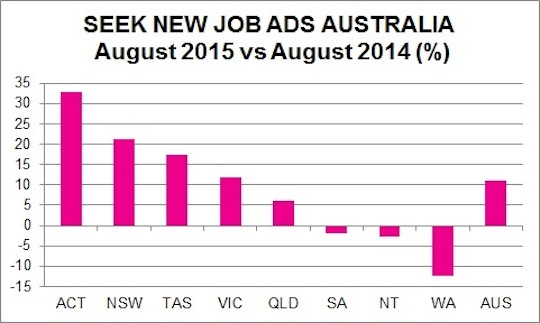 South Australia (also down 3%) is also experiencing softening in marketing jobs due to depressed manufacturing, while Queensland, despite its significant exposure to mining, is experiencing a 6% jobs rise overall, due to its more mixed economy, including significant tourism, agricultural and services sectors.